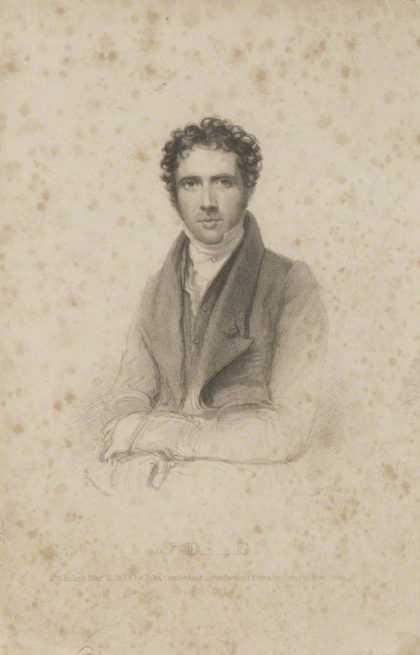 Between 1823 and 1831 John Cumberland published Cumberland’s British Theatre, a compendium of 300 plays in 39 volumes taken from the acting copies of The Drury Lane Theater. Cumberland’s editions include all of the Shakespeare plays as performed at Drury Lane. The volumes provide a thorough survey of 18th century drama. Rev. Townley’s High Life Below Stairs was included in Volume 13, published in 1926. Cumberland’s Volume 13 containing the play is on Google Books here. This “acting copy” of High Life is the earliest edition (I know of) showing the punch line of “Ben Jonson” to the question; ‘”Shikspur, who wrote it?” Cumberland’s editions also include specific stage directions as well as descriptions of the costumes used in the 1826 production of “High Life.” Here’s the costume description for the “Duke’s Servant” the Shaksper character in the play. The Duke’s Servant wore “an orange-coloured coat and waistcoat with black edging and silver binding, shoulder knots of silver.” The earl of Oxford’s livery colors were tawny and silver. Tawny is a shade of orange. Let’s examine the Shikspur scene in some detail. Below is a side-by-side comparison of the “Shikspur. who wrote it?” scenes in the 1826 “acting copy” published by Cumberland (left) and the 1759 first edition (right). There are four lines added to the scene in the acting copy, highlighted in red italics below. “Lady Bab. Shikspur. Did you never read Shikspur? Sir Harry’s Servant. I never heard of it. Kitty. Shikspur! Shikspur! Who wrote it? No, I never read Shikspur. Lady Bab. Then you have an immense pleasure to come. Duke’s Servant. Shikspur ! Who wrote it? Sir Harry’s Servant. Who wrote it? Why, Ben Jonson. Duke’s Servant. O, I remember, it was Kolly Kibber! The four added lines suggest that someone other than Shakespeare wrote Shikspur. The added lines all belong to the Duke’s Servant and Sir Harry’s servant. They are present in the scene in the printed version, but do not participate in this discussion. I think it’s noteworthy that in addition to providing the suggestion that Shakespeare did not write Shakespeare, the added lines change the nature of the question. The phrase “Who wrote it?” appears only once in the printed copies. In the acting copy, it is spoken three times. A witches prophecy perhaps. The 1826 edition of High Life Below Stairs published by John Cumberland includes a set of prefatory biographical and critical remarks. The remarks for the entire Cumberland’s series were written by George Daniel and signed, D._______ G._______. In the remarks, Daniel comments on the Shikspur scene, including the never-before printed “Ben Jonson” line. I have bolded the last sentence of the remarks. They are curious. Remember, the characters are all servants, and they all address each other by their master’s titles and/or honorifics. The Duke’s Servant is referred to as the Lord Duke and also “his Grace.” The nobles who employ these servants are not characters in the play, excepting Lovell, who is the master to Phillip, and Miss Kitty and the others of that house. Lovell is the master who disguises himself as a boy to learn the ways of service. When the remark states “had my Lord Duke been present” it is nonsensical on its face, because the character of the Lord Duke’s servant is present in the scene! The line “credit me” is in the play, and is spoken by the Duke’s Servant, but it is in another scene with no bearing whatsoever to the discussion. Had my Lord Duke been present, “credit me.” The “lord Duke been present” referenced in the remarks only makes sense as the actual Lord served by the Duke’s Servant. The author of the remarks is telling us this man would take credit for writing Shakespeare if he were present. Our hypothesis coming in is that the Duke’s Servant stands for Will Shaksper and that Will Shaksper was once servant to Edward de Vere, the earl of Oxford. In my reading of these remarks, George Daniel is stating that the Lord who the Duke’s servant served would take credit for writing Shakespeare if he could. Earlier in the Remarks Daniel writes. High Life is, on the surface, not about noblemen aping lackeys. And yet, that sentence from Daniel perfectly describes the situation we first encountered in Thomas Nashe’ The Unfortuate Traveler of 1592, where the nobleman and page change places. by Richard Woodman, published by John Cumberland, after Thomas Charles Wageman, stipple engraving, published 1838. Image courtesy of National Portrait Gallery via Creative Commons License. George Daniel’s wiki entry is here. He wrote verse and prose in addition to his work for Cumberland’s British Theater project. He was an avid book collector, owning copies of Shakespeare’s First, Second, Third and Fourth Folios. He was also the proud owner of Garrick’s cassolette, the mulberry box carved from tree in Shakespeare’s garden and given to David Garrick. Daniel willed the box to the British Museum. His book collection was sold at auction after his passing in 1864 and netted over 15,000£. The catalog of that auction makes fascinating reading, and is a potential starting point for further authorship research. That catalog is on Google Books here.